There’s nothing worse than having to work in a cold office or live in student accommodation or a residential care home when the floorcovering doesn’t offer that all important thermal performance – especially at this time of year! Carpet has been proven to offer exceptional thermal performance, but why is this? Basically, if a floorcovering has good insulation properties it will reduce the rate of heat being lost and so make the room feel warmer. With hard surfaces, such as timber or tile, heat will be lost through the floor quite rapidly. Other materials, such as marble or concrete, are very dense and so require a lot of energy to pass into them to warm up. Carpet, on the other hand has a much lower density, because most of the volume is occupied by air. It, therefore, warms up very quickly to the temperature of your skin, at which point it prevents further heat loss and feels warm. There have been many trends in floorcoverings for offices, schools and student accommodation over the years, where vinyl and hard floorcoverings have been tried, with mixed results. Some interior designers have specified these floorcoverings because they like the aesthetics but the reality is that living with them day in, day out can be quite a different experience. Research has shown that many people like the comfort underfoot of a carpet, particularly for an area where they sleep and relax. 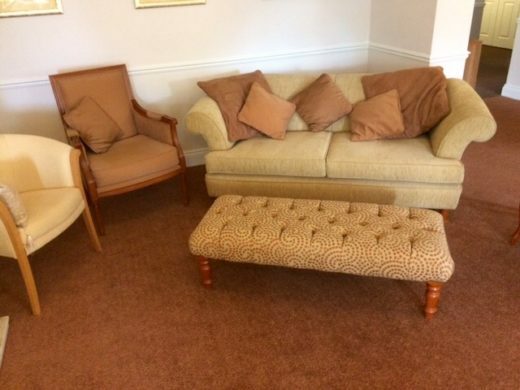 It is little wonder that carpet is so widely specified for care homes and sheltered accommodation. Older people and those who are less mobile feel the cold more than others and as around 15% of a building’s heat is lost through the floor; it is, therefore, very important that this heat is conserved. Recently, our tufted carpet Total Care was specified for a development of retirement apartments in Solihull. The company responsible for maintenance of the complex consulted with residents about which floorcoverings they would like. Our tufted carpet was chosen as it offers comfort, durability and is extremely hardwearing. For residential care homes in particular it is important that the floorcovering chosen keeps service users safe and is comfortable, as well as creating that ‘home from home’ feel. It should also meet the 2010 Equality Act, so residents can easily move and be moved around the premises. At this time of year, temperatures can be below or just above freezing for a large amount of time. Where high quality tufted or fibre bonded carpet is fitted this means that occupants have greater peace of mind that thermal performance is maximised in their building. It also provides a higher degree of comfort, whilst helping to save energy.